ET Metrix is Responsive Joomla! template that targets medical websites. Medical Joomla! 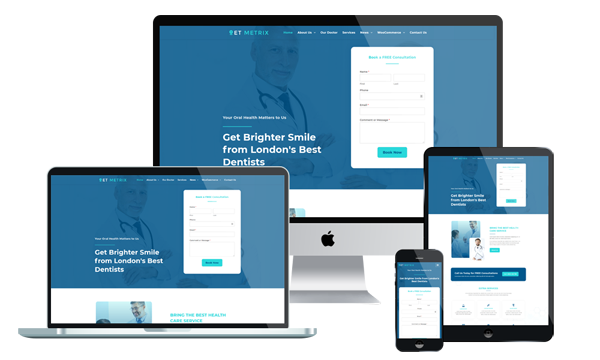 Templates embrace many particularly healthcare spheres, psychological counseling, dentistry, pharmacy, pediatrics, ophthalmology, plastic surgery, weight loss, and others. This template will allow you to create your online project that deals with medicine with no extra efforts and money. Pleasant to eyes layout, proper functionality – ET Metrix template go with everything you need to attract the attention of your targeted audience and make them interested in your project. ET Metrix is 100% responsive, which means that they are accessible via all desktop and mobile devices. All of these will be fully functional in the template’s responsive design that fits well into all browsers, including mobile, thanks to cross-browser compatibility. You can highlight best deals and featured healthcare package easily. Visuals are prominent, sliders and banners help you grasp your clients’ attention. Introduce your professionals, answer all possible FAQ, showcase your services and add testimonials. Our advanced Medical Joomla! Templates make the process of choosing the right healthcare center easier and help your clients get in touch with you. It also builds with latest Bootstrap CSS Framework, Support Font Awesome and K2 extended style. Furthermore, it comes with 4 color schemes helping to create excellent websites with various layouts. Make sure they choose you by buying our specialized Medical Joomla! Templates.